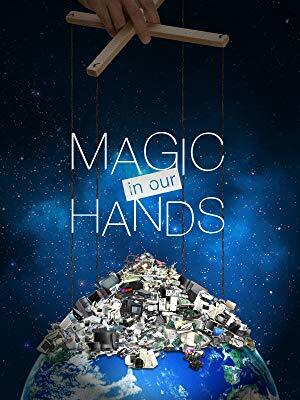 Ms. Vicky Hart's documentary film "Magic in Our Hands" -made on Sphoorthi's work is now on Amazon. Our film www.magicinourhands.com featuring SphoorthiTheatre Steparc has been picked up by Conscious Good whose mission is to elevate the human experience and collectively heal the world one inspiring story at a time. How awesome is that?! V6 Velugu-Telugu Newspaper Life Magazine Kala page dated April 11, 2019. Andhra Jyothi Telugu Newspaper about the workshop dated April 08, 2019. The Hindu-Metro Plus Hyderabad Edition dated March 21, 2019. "Best out of Trash' - BOOT"
STEPARC looks forward to be associated in organizing seminars and lectures on Puppetry, story telling, folk lores and folk arts of India. 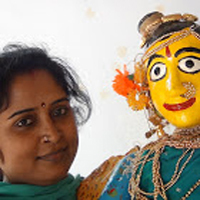 Rainbow represents the colour and vibrancy that the organization aspires to bring about in the Educational domain through the medium of Puppetry. "Two Puppets a Girl and a Boy symbolize the unbiased approach towards Children and giving equal importance to both. Further it also symbolizes the Heritage of Music / Dance. Puppetry being a Visual medium has the ingredients of the rich Dance and Music as an art form. an M.Phil in Sociology, Postgraduate in Social Work, P.G. Diploma in Women's Studies, having long associated with cultural & art forms acquired vast knowledge and versatile expertise. Characterized by strong enthusiasm, envisaged and passionately striving to bring-in radical changes into the training methodology for imparting knowledge to learners.